Combination EFIS and EMS plus probes. Pilots may elect to display both functions simultaneously in split-screen format or switch over to a full screen EFIS or EMS via simple hotkey commands. Six buttons arranged along the bottom of the screen provide the pilot-interface via a softkey driven menu system for easy access to in-flight functions and setting pilot preferences. The FlightDEK-D180 features a 7" diagonal, color LCD boasting the highest resolution in its class. The stunning display features large, easy to read text and graphics all in one convenient location. A powerful processor driving the display graphics ensures real time fluid motion at all times. 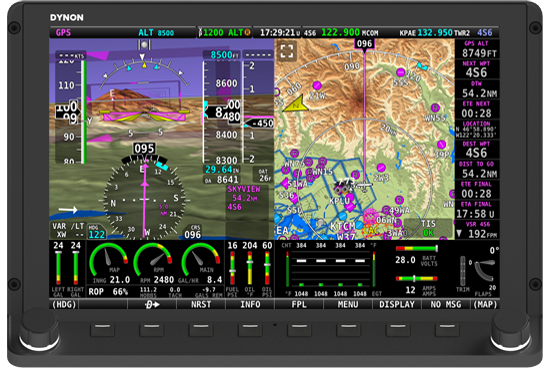 The FlightDEK-D180 incorporates state-of-the-art EFIS electronics design. The primary functions provided include attitude, airspeed, altitude, vertical speed, gyro-stabilized magnetic compass, slip/skid ball, turn rate, clock, timers, g-meter, and HSI. This instrument features Dynon's advanced ADAHRS (Air Data, Attitude and Heading Reference System). This design integrates over a dozen solid-state sensors that deliver exceptional performance and reliability. With the exception of the remote compass, the ADAHRS is built directly into the EFIS-D180 instrument saving installation time and space. Each ADAHRS undergoes a rigorous calibration at the factory to ensure accuracy over its full operating range. Unlike mechanical gyros, Dynon's rugged design is tolerant to aggressive flight maneuvers, automatically corrects itself anytime its gyros' capabilities are exceeded and cannot be damaged by performing aerobatics. Dynon's FlightDEK-D180 additionally features an Altitude Encoder Output for connection to a transponder and a density altitude and true airspeed calculator. The FlightDEK-D180 replaces up to 16 different types of gauges. What makes this system so powerful is its ability to continuously monitor up to 27 available sensor inputs that cover the engine, fuel and other miscellaneous systems and annunciate any abnormality immediately upon detection. This constant scan significantly reduces the pilots workload while providing a more thorough and consistent review. Dynon offers a variety of probes to accompany the FlightDEK-D180 instrument with very attractive package pricing. The probes offered by Dynon are optimized to support a variety of engines including Lycoming, Continental, Rotax, Jabiru, and ULPower. Probes may also be purchased individually to monitor other types not specifically packaged by Dynon. Individual sensors and harnesses are available for purchase to accomodate customers that do not have one of the above engines. The FlightDEK-D180 uses three separate wiring harnesses for connections to power and all of its I/O. All harnesses are optionally available. 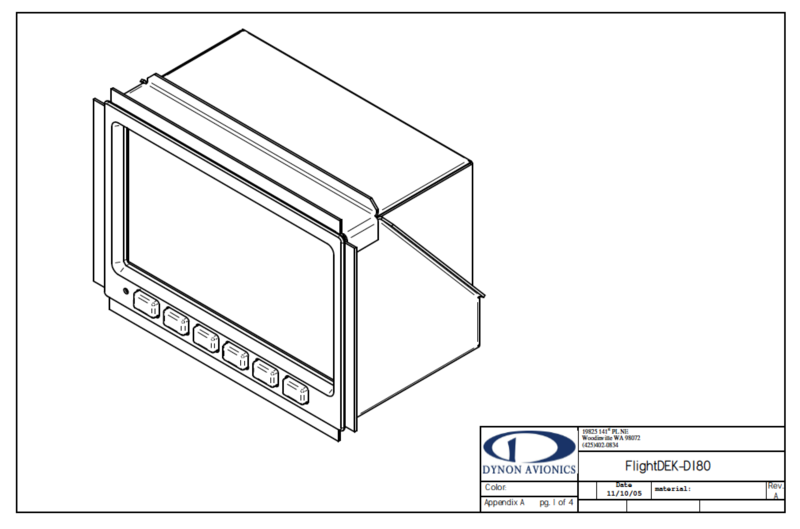 See the FlightDEK-D180 outline drawing for an overview of the connections. The two engine harnesses are available either separately or in conjunction with one of the probe packages Dynon offers. The third primary instrument (EFIS) harness is available as a separate option. 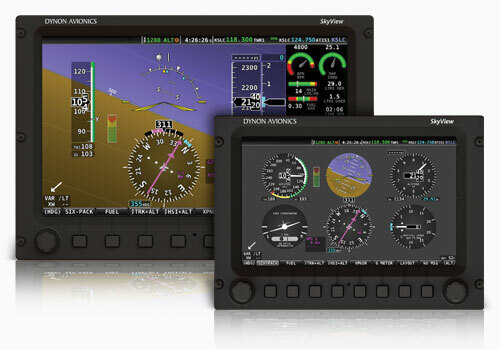 Dynon's FlightDEK-D180 utilizes an embedded, multi-processor design that delivers real-time performance and stability. This purpose-built design is unencumbered by burdensome operating systems that typically slow down performance and require long boot times. Dynon's software design enables complete control to maximize execution speed and deliver robust reliability. A hallmark of the FlightDEK-D180's performance and a great safety feature is its ability to display the correct attitude within a few seconds of being powered on while in flight. A key safety feature available from Dynon is its optional AOA/Pitot design that combines Angle-of Attack (AOA) and Airspeed into a single pitot design. The AOA capability assists pilots on approaches and generates an alert signal for audible annunciation whenever nearing stall conditions. This pitot is available in heated and non-heated versions. To guard against a power failure scenario, the FlightDEK-D180 may be optionally equipped with a Li-Ion Backup Battery. When power loss is detected, the instrument will automatically notify the pilot and immediately begin running on battery power for a minimum of 1.5 hours to enable a safe landing. The EFIS-D180 is equipped with a PC serial interface which provides the capability of uploading 25 user-defined lists for use as checklists, aviation data or other information that pilots wish to keep handy. 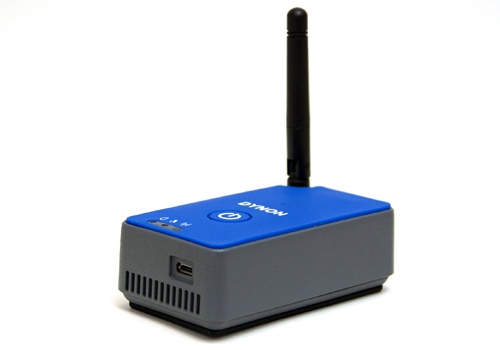 The PC interface additionally facilitates downloading lifetime free program updates made available from Dynon's website. 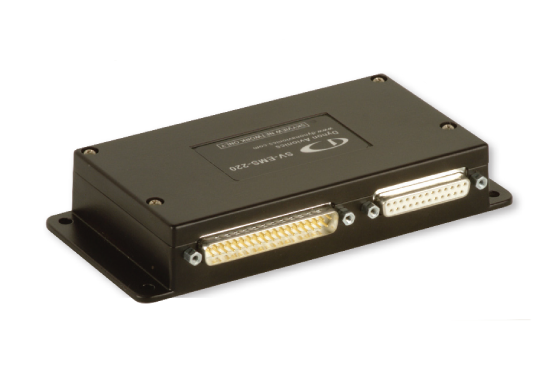 Dynon is developing a series of expansion modules that will add new capabilities and functionality to its existing line of EFIS, EMS and FlightDEK avionics. These optional modules provide exceptional value and performance while preserving the affordability of Dynon's existing equipment. This modular concept promotes greater flexibility when configuring new aircraft panel systems and facilitates future expansion if so desired.